Happy Friday! 2 weeks of Axios Sports down, 1 bajillion more to go. Programming note: We'll be off Monday for MLK Day, so see you back here bright and early on Tuesday. While you were sleeping, 17-year-old American Amanda Anisimova upset No. 11 seed Aryna Sabalenka, 6-3, 6-2, to reach the 4th round of the Australian Open. "This is an unreal feeling," she said in a post-match interview. "I can't believe this is happening right now." Why it matters: The New Jersey native is the youngest American to advance this far at the Australian Open since Jennifer Capriati in 1993 — and the youngest to advance this far at any Grand Slam since Serena Williams in 1998 (French Open). Decent company, I guess. 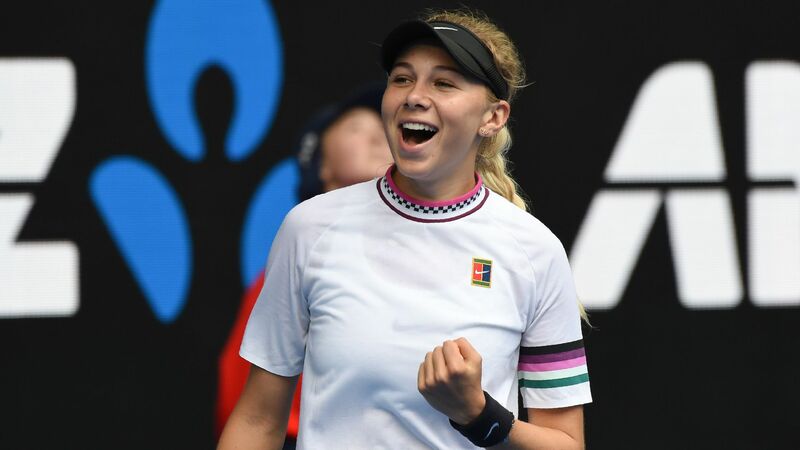 Go deeper: "Anisimova has been a champion-in-training for much of her young life," wrote the NYT's Christopher Clarey in a profile last March. "Nobody should get carried away," the USTA's general manager for player development, Martin Blackman, told Clarey. "But she's a special player. With a special ability for handling the moment." 🎥 Watch: Anisimova's forehand winner in the 2nd set was easily the shot of the tournament thus far. More Aussie Open: Maria Sharapova knocked off No. 3 seed Caroline Wozniacki, Serena looked as dominant as ever and Roger Federer, Rafael Nadal and Frances Tiafoe all took care of business in the men's bracket. In a world increasingly dominated by hot takes, fantasy sports and 15-second clips on Instagram, it's easy for us to forget what team sports are actually about: camaraderie. Thankfully, journalists can occasionally break through that noise and use some good ol' fashioned on-the-ground reporting to remind us of this fact; a pulling back of the curtain, if you will. What's happening: The Athletic's Scott Cruickshank did just that with a wonderful piece (subscription required) about the Calgary Flames' dressing room dynamics that brought me back to my high school basketball days (miss you, locker #8). Cruickshank talks about the Flames' dressing room as if it were a city — each area functioning as a unique neighborhood with its own residents, vibe and price point (typically in "years served," as opposed to dollars). Just like in-season training or an offseason trade, something as simple as locker assignments can have a massive impact on the internal workings, and success, of a team. Goalies always sit closest to the door because they walk out first, while rookies are traditionally funneled to the corners and veterans occupy the center. "Proximity to [captain Mark] Giordano is a selling feature. Like good schools and green space, his highly regarded presence jacks the value of the entire block." The lockers near the showers are considered undesirable, as it can get quite hectic. But 24-year-old Sean Monahan calls this neighborhood home and loves it. "It's my little area. … I couldn't see myself somewhere else in here." For away games, things shake out differently as every NHL arena has its own unique dressing room layout. Anaheim, for instance, has one particular "island" locker that sits all by itself with walls around it. In Calgary's case, equipment manager Mark DePasquale keep things consistent: "If you sat 3 seats from the trainer's room at the Bell Centre last year, bank on your gear being there next time and the time after that." Boogie's back. After spending the last year recovering from a torn Achilles, DeMarcus Cousins is expected to be in the Warriors' starting lineup against the Clippers tonight. Patriots: "There is an old sitcom rule that perfect television is made by spending the first two-thirds of a show getting a character into hot water and the last third getting him out of it." Chiefs: Good news, Kansas City fans. According to FiveThirtyEight's Elo rating system, your team will win on Sunday. In Week 8, the only teams with double-digit Super Bowl odds according to this system were ... the Chiefs, Patriots, Rams and Saints. Clearly, Mr. Elo has seen the future. Saints: Drew Brees completed an NFL-record 74.4% of his passes during the regular season. The Wall Street Journal took a closer look at the QBs mind-boggling accuracy, and what they found is actually ridiculous. 62 of Brees' 125 incompletions were catchable, and 20 were the product of something other than off-target throws (including 16 balls he intentionally threw away). That leaves 43 passes (8.8%) that were off the mark. Are you kidding? Rams: I'd just like to take this time to apologize to Rams fans for incorrectly saying your team hasn't been to the Super Bowl since 1999 (I meant hasn't won since '99, as you also made a trip in 2001). For your sake, I sincerely hope that my inexcusable mistake enraged the football gods, who will now see you through to the next round. Or, at the very least, maybe sudden X-factor C.J. Anderson reads this newsletter and is now ready to run through a wall. Sorry/you're welcome. "When the Philadelphia Phillies met with Bryce Harper last Saturday, their best sales pitch should have been this: You have the opportunity to play the prime of your career in a great hitters' ballpark," writes SI's Tom Verducci. By the numbers: Since 2012 (the year Harper debuted), Philadelphia's Citizens Bank Park has ranked 6th on average in Home Run Park Factor, which measures how home run-friendly a ballpark is. Nationals Park, the only home Bryce has ever known, ranked an average of 19th over that same time period. The past 5 NFL drafts (and 9 of the last 10) have seen teams use the No. 1 overall pick on either a QB or a pass rusher. According to ESPN draft "expert" Mel Kiper's first mock draft (subscription required), that trend will continue in 2019. Be smart: The draft isn't until Apr. 25, and we still have college all-star games, combine testing, pro days and plenty more to get through. In other words, this mock draft means nothing. But hey, it's fun to debate. In the 2000 NFL Draft, the Patriots famously drafted Tom Brady in the 6th round with the 199th overall pick. Question: Can you name the 6 QBs drafted ahead of him? Hint: 2 of them played college football in the state of West Virginia. Professional bull rider Mason Lowe, 25, died this week after a bull stomped on his chest during a competition in Denver. Lowe is believed to be the 3rd bull rider killed since Professional Bull Riders' debut season in 1992. "He was thrown off the bull and while he was on the ground the back legs stomped him in the chest ... When he got up he immediately grabbed his chest and stumbled over to the exit and then fell to the ground again grabbing his chest before he could get out of the area. They took him out on a stretcher." 1 year ago today, Brazilian surfer Maya Gabeira rode a 68-foot wave in Nazaréin, Portugal — the largest ever surfed by a female athlete. Enjoy. Rewind: 5 years prior to breaking the record, Gabeira almost died in the same waters. She broke her ankle after a giant wave knocked her over and was found floating face down. Go deeper: Read more about Gabeira's triumph. 🏀 The Oklahoma State men's basketball team is desperate for bodies after a recent round of player suspensions, so they're holding open tryouts for students who want to join the team. ⚽️ Ahmed Hussein-Suale, an investigative journalist in Ghana, was killed by gunmen Wednesday night after he helped expose corruption in the country's football association.